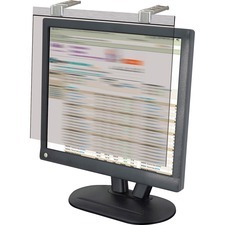 LCD privacy/antiglare filter with anti-reflective coating produces a crisp and sharp image on your 17" to 18" monitors. Neutral light tint delivers a bright display with true color fidelity. Filter reduces glare by 95 percent and enhances contrast to help prevent eyestrain. Anti-privacy feature prevents unauthorized view of sensitive information. Filter protects your delicate LCD surface from scratches and other damage. Elegant frameless design coordinates well with black, gray or silver monitors. Filter is made of optical-quality acrylic and includes a Microfiber cleaning cloth.